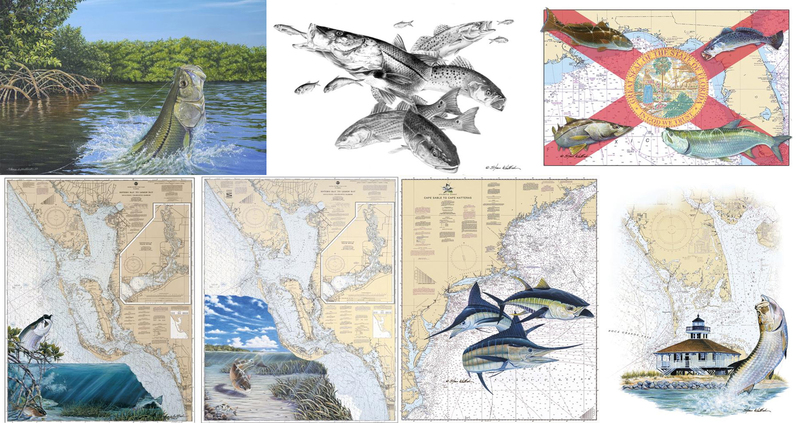 Steve Whitlock Nautical Chart Art with Saltwater Game Fish Paintings of Tarpon & Snook: Renowned game fish artist Steve Whitlock offers nautical chart art and paintings for sale with saltwater wildlife like jumping tarpon, snook, sailfish, dolphin and more. Masterfully painted on nautical charts from Boca Grande Florida and the Fl coast from the Keys to the panhandle and all the way up the eastern seaboard. A Florida native and military veteran, Steve perused his passion for fishing by acquiring his captains licence in 1985. After a short carrier guiding clients on inshore fishing charters around Naples and the Everglades for Snook, Redfish and Tarpon, he was inspired to start painting the incredible outdoor scenes he'd been sharing with traveling anglers. After a great deal of encouragement and support from his wife, family & friends, Steve applied to the Ringling College of Art and Design in Sarasota, FL. He had started down a path towards becoming a wildlife artist, and in our opinion the best in the industry. Steve graduated from Ringling in 1998 earning a Bachelor of Fine Arts Degree as an Illustrator, and hasn't looked back since. We encourage you to visit Steve's website via the link above and see what many consider the finest wildlife artwork available today. We aren't the only ones here at Boca Coast who are proud to display Steve's art on our chum products. His current corporate client list includes; Bass Pro Shops, Coastal Conservation Association - Florida and Texas, Florida Game and Fish Commission, American Products Group, Tempress (Custom Cooler Seat Cushion designs), Tervis Tumber, Texas Parks and Wildlife, and The National Rifle Association. If you're looking for a highly experienced wildlife artist for your next product or custom private commission, we highly recommend Steve Whitlock.